Virtual and toll-free numbers are secondary numbers that ring to an 8x8 extension and are not attached to a specific phone or device. By default, numbers are directed to the Auto Attendant. In order to change the destination of these numbers to a ring group, call queue, individual extension, fax, or Virtual Office Meetings, use the Virtual and Toll-Free Numbers feature. 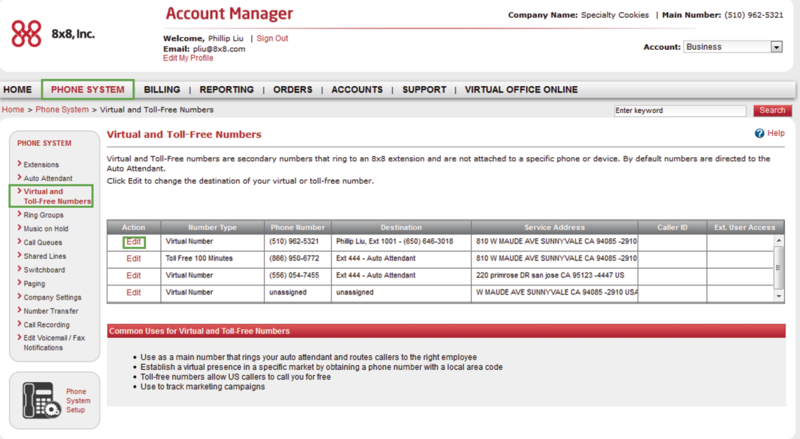 Under the Phone System menu, click Virtual and Toll-Free Numbers. Click Edit to change the destination of the desired virtual or toll-free number. Fax: The number becomes available for the Virtual Fax extension. Fax extension is available on Virtual Office Pro. 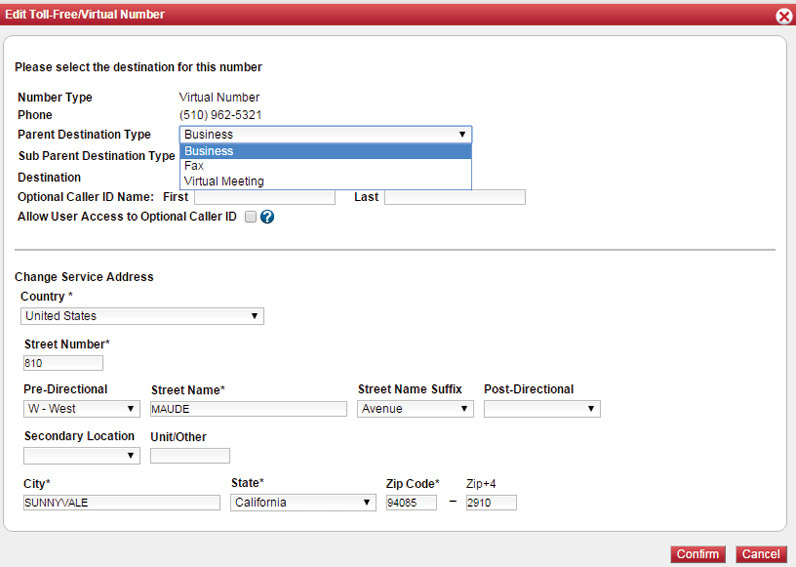 Virtual Meeting: The number becomes available for use as a Virtual Office Meetings dial-in number. Virtual Office Meetings is available on Virtual Office Pro. From the Sub Parent Destination Type drop-down, select a service type (such as call queue or ring group) associated with this number. Select an Optional Caller ID Name. Select Allow User Access to Optional Caller ID. This option allows the extension user to access the caller ID number from the Virtual Office desktop app. If selected, the optional caller ID number is displayed on each outbound telephone call made from this extension. Enter a new location, or Change Service Address. The service address describes a detailed location required by the emergency service providers.